While admittedly not first-class writing, I tend to rush out and gobble up each new Kathy Reichs book as soon as it comes out. When I read 206 Bones last year, I noted that the series had deteriorated from the early books but was looking up with 206 Bones. Spider Bones isn't the best in the series, but isn't the worst either. It was a fast, easy read, and provided a change of scene from the usual setting of Montreal/North Carolina with a shift to Hawaii. And the mystery was a departure from the usual as well - there was a murder mixed up in it all waiting to be solved, but the primary story focused on trying to figure out how two bodies could have the same identity. That was a bit too easy for me - I figured out early in the book how the mistake had been made - but then there were lots of red herrings thrown in, and it was interesting to see how the characters proved it. 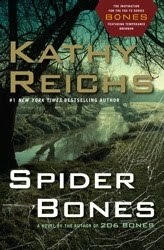 I have never seen the television series Bones which is (very) loosely based on this series of books, and for which Kathy Reichs is a producer, however there is a laugh-out-loud reference to the television programme in this book. And if nothing else, this book has made me want to visit Hawaii some day! And it counts towards the Canadian Book Challenge over at The Book Mine Set. The Giller longlist is set to be announced on Monday - I'm looking forward to seeing which books make the list this year; and then the shortlist which will be announced on October 5.